We are looking for 10 men and 10 women who want to achieve a complete body transformation by the end of the year. Whether your goal is to drop a dress size or two, fit into that tailored suit for a wedding, or simply feel more confident in your own skin, we’ve got you covered. 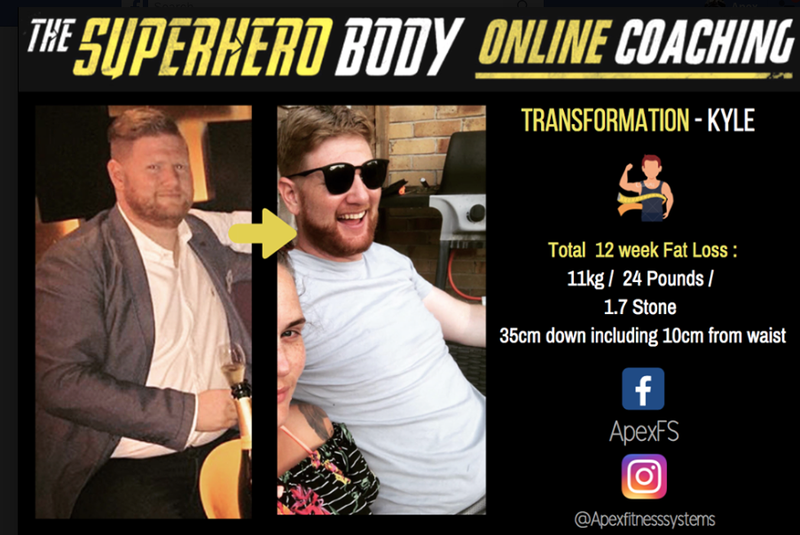 The Apex Superhero body online is a 12 week group coaching challenge designed to take normal people with busy lives, and transform them into the very best versions of themselves. Through a tailored training program, bespoke nutrition program and private members only group, we are here to keep you on track and coach you every step of the way. We are looking for highly motivated people who are tierd of fad diets and boring exercise plans. If you're looking for a quick fix, this challenge isn’t for you. If you aren’t willing to work hard for your results, this challenge isn’t for you. If you don’t want to invest in improving yourself in the long term, this challenge isn’t for you. But if you’ve tried everything to get in shape before and you’re finally ready to do things properly, you might be the exact candidate we’re looking for. Kyle smashed the challenge, losing an amazing 24 pounds of body fat, gaining lean muscle and dropping multiple inches. I recently completed the 12 week Superhero body online challenge and everyone is amazed at the results I achieved in such a short time. I have previously done fad diets, training with PT’s but keeping my diet (slabs of cake) the same. I got recommended Apex from friends and straight away knew I made the right decision. The meals plans, recipes, support, varied training plans and quality weekly tips from both Matt and Tom helped me not just lose weight but really change my mindset to my diet and training myself into a healthier person. Although it was a group challenge I felt everything was tailored to me and my circumstances but the group support was great at helping motivate me further. Check out the incredible progress from our Superhero Body Online client Leanne. We're blown away by her consistency in the gym and with her nutriton, resulting in over 1.5 stone down but an even bigger transformation in measurements and body shape, dropping down 2 clothes sizes! I have never stuck to a diet in my life, always kept saying i would do something about my weight and never did until i saw a post about Apex on facebook. I signed up with a friend so that we could support each other and it is the best thing i have ever done. I have realised that food wasn’t making me happy and i needed to break the unhealthy cycle. With the right support and guidance i quickly realised where i was going wrong and just how bad my food choices were. I learned what to eat to fill me up and committed myself to the training plan and surprised myself when i began to enjoy exercise for the first time ever! The online support was great and the guides easy to use. I feel fantastic and can’t thank matt and tom enough. Check out the results Rich achieved, who is looking like a new man after dropping just under 10kg in 12 weeks, losing an insane 14 cm from his waist. Throughout his time on the challenge he stayed consistent with the nutrition program, continually dropping body fat even with a 5 day trip away on a stag do in the middle. He's also built visable lean muscle from following the training program, clearly putting the graft in in the gym. Rachel joined the challenge already in great shape, looking to become more defined and build some lean muscle. I think it's fair to say she has completely smashed those goals! Dropping over a stone of body fat and multiple inches, while gaining lean muscle and improving her strength. She's achieved this as a mum with a busy family life, while also managing her diet and training while on holiday during the 12 weeks.  I have just finished my first challenge with Apex Fitness Sytems and can honestly say they know their stuff. Great to have a team working with you from nutrition and training background to get you the best possible results. They keep it real and only give you scientifically proven info and advice and if you follow their plan you will see great results. Three months in i am stronger, lighter and a body shape that is much more defined. I feel confident now in making good food choices and know i will continue to lift weights as part of my weekly routine. Matt and Tom are so approachable, knowledgeable and professional, they made this journey so easy for me. No question is ‘silly’ and they cater for all abilities and situations. They are the perfect balance of giving you all the information you need, but also encouraging you to make the actual decisions yourself to make sure those good habits really stick. One of the key things I’ve learned during the process (as well as how to do a proper RDL!) is accountability and ownership of my choices. I think this is where the online program really works. Bex joined the challenge wanting to drop some body fat, aiming for a leaner and more defined shape, which she has definitely achieved! She's also gained lean muscle and strength from her consistent work ethic in the gym. The support, advice and information we were given during the 12 weeks was amazing. The training and nutrition plans are easy to follow. Tom and Matt were always available to answer any questions or reassure me when I had a wobble/melt down about something. I would like to say thanks to Matt and the Apex team. I’ve just completed their 12 week body transformation challenge. I’m a relatively fit person approaching 50 years old. I was happy with my BMI and weight, I just wanted to cut body fat. Pre-challenge I was 10% body fat. At the end of the challenge I was just under 8%. What was even more impressive was that I’d gained muscle and size, yet still cut that fat. I have used Matt for nutrition advice in the past with great results, but combined with the exercise program the results have been great! This challenge came at the right time for me and was just what I needed to get back to training and to get my nutrition back on track. I found the training and nutrition plans easy to follow. Matt and Tom provided constant support and advice to keep us on track. Why choose the superhero body online - WINTER WARRIOR? By signing up, you receive everything you could possibly need to transform your body by the end of the year. The challenge combines both tailored training and nutrition into one package. This represents fantastic value for money when compared to other options on the market. Do you think you could budget just £2.90 per day to transform your health, your fitness and your body by the end of this year? The average cost of personal training alone in the UK is £30 per hour. 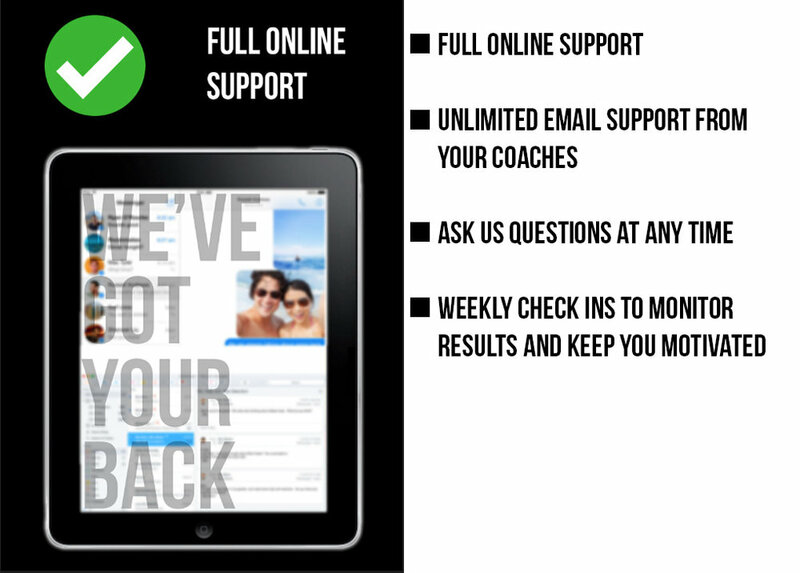 Online coaching represents excellent value for money, as these services in person would cost you up to 3-4x as much. With online coaching, we are with you 24 hours of the day, providing not only bespoke training and nutrition programming, but education, support and motivation to change your body and health for good. Sign up ends - Bank Holiday Monday 27th August! Q - Do I need to be super fit and experienced in the gym to do this? A - Absolutely not. We'll tailor everything to your experience level, even if you’re completely new to exercise. We coach a wide variety of fitness and experience levels, every level is catered for. Q - I tend to struggle with motivation! I want to see results, but how will you keep me motivated enough to stick to the plan? 1 - Our coaching. We will provide you with constant support, daily tips, videos and ongoing education that will help change your habits for good. 2 - The group. You'll be doing the challenge along side a group of people all aiming for the same goal as you. We use the group to share tips, recipes, food pictures etc etc. We encourage everyone to interact and help each other. 3 - The results you get. We get you to complete a weekly check in process, which involves taking measurements and photos each month. A big part of the motivation is seeing the positive changes in your body and health week after week. Q - I don’t have access to a gym, can I do the workouts from home? A - Yes. Although we recommend to get the absolute most out of the challenge, workouts should be done from a fully equipped gym, we can design you home workouts if needed. Q - How does payment work? A - Payment is taken completely securely via direct debit, on the final day of each month, starting with Sept, then Oct, and finishing in November. Everything is set up automatically, and set to end after 3 payments over 3 months. Q - Is the diet super restrictive? A - No. The nutrition program is designed specifically to be flexible. There will be no ‘banned foods’ or counting of points. You will be asked to track your intake daily and aim to meet your personalised nutrition targets each day. You can chose exactly what you eat. If you like structure and something to follow, you’ll be provided a full 7 day meal plan showing you exactly how to hit your targets with your favourite foods. Q - I have a busy schedule, is the challenge a big time commitment? A - No. There are 3-4 weekly workouts lasting 1 hour or less each that can be done on any day and time that suits you (although we will give you a recommended schedule) diet planning is easy to manage if you set aside a few hours each week to food prep. Q - I’m going on holiday during the challenge, does this affect things? A - No. That’s exactly what the challenge is for! The beauty of online coaching is that you won't miss out if you're on holiday. Ideally your holiday will come towards the end of the challenge so you can show off your results, but it’s not a problem if it’s in the middle. We can even provide you with hotel room workouts and nutrition tips to stay on track while you’re out there.